This farmer's breakfast or Bauern Fruhstuck as it was called while growing up is a healthy and hearty potato recipe that can be used as a breakfast recipe or a filling meal for any time of the day, that will satisfy your family for the rest of their day. The potatoes that are cooked in a big skillet or frying pan(a non stick or quick cook pan is best, but a 1/4 stick of butter works well) Eggs and additional toppings of your choice makes this meal cover all of your family's food group needs. Our kids love to help with the chopped up potatoes, mixing the eggs and adding the cheese. 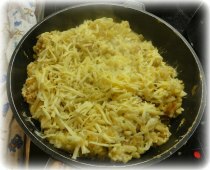 This getting healthy for breakfast recipe with potatoes is ready in 30 minutes, saves us time and grocery money so we usually use it once a week on our busiest 'after school activity' day. Whether you make this Bauern Fruhstuck for breakfast, lunch or dinner it will carry you through the day or the rest of the night. A 'quick-cook' pan shouldn't need any butter but our pans need a bit. Turn heat down to a 4 turning potatoes over often to prevent any potato burning. Prepare egg mixture in between times of turning potatoes over. Continue turning over the potatoes in the pan. When the potatoes are cooked through and break apart easily(approx. 10-15 minutes) pour the egg mixture over all the potatoes. 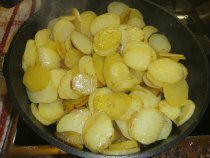 Mix around occasionally to allow the eggs to cook throughout the potatoes. The bauern fruhstuck recipe steps #3-#5 are optional additions you can try(they do need to be done while continuing to turn over the potatoes). We have included them for some extra flavor and variety, and we are sure you and your family will enjoy any combination. Pile the potatoes, eggs and side orders onto toasted bread plain or with garlic butter for an extra power boost to your day. 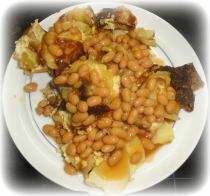 Try some of the optional steps, and enjoy making this hearty and great tasting breakfast recipe together for any meal. Any Day of your Week Meal!